The Kallman Legal Group office was designed and built by Darius Moon, a famous and self-taught local architect and builder in the Lansing area in 1879. 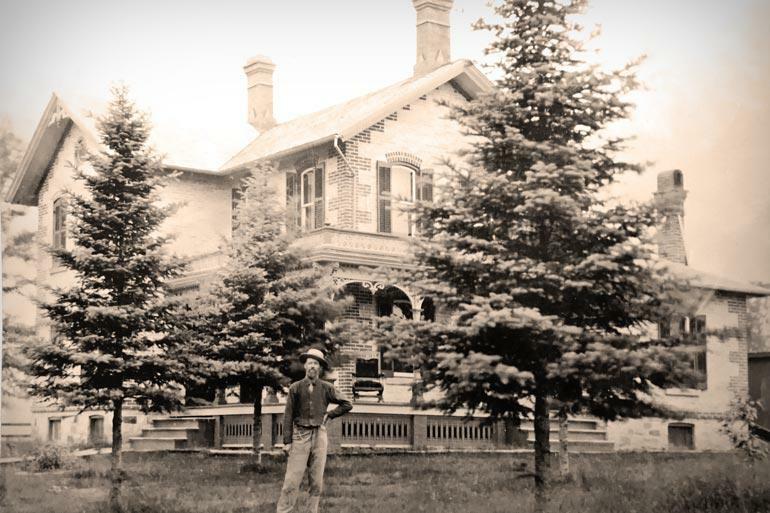 He built the farmhouse for a local farmer (pictured above), and it was the family home for a large dairy farm. Darius Moon was one of seven children, and they all lived in a small log home that is now the centerpiece of the Woldumar Nature Center in Lansing. He was the architect for the R.E. Olds mansion in downtown Lansing (now torn down). He also designed more than 200 homes and businesses in the area including two stately Victorian homes now on Lansing Community College’s campus. The home was in the Guenther family for more than 80 years, and there are still peony bushes that were brought from the Netherlands more than 85 years ago on the property. Even though the home was damaged by tornadoes two different times, it still stands proudly after restoration. The architecture could be considered Folk Victorian, and features very unique brickwork on the outside. Architecture students from several states come to see the brickwork and home almost every year. The Kallmans own an original tintype photo of Mr. Clemens standing in front of his home (pictured above). It has been fully restored with new heating, electrical and plumbing, and is lovingly cared for as a matter of stewardship. It has been on the National Register of Historic Places since 1979.